Would you pay $1,175 to live in the Harold Ickes Homes? Some fear that higher rents will drive away public housing's highest wage earners. 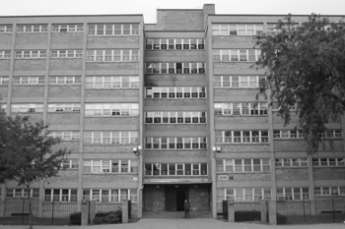 With two working parents and an annual income of $36,000—about three times higher than the average family at the Altgeld Gardens-Murray Homes complex at Chicago’s southern end—Anita Williams and her family would appear to be ideal role models for public housing. But Williams, her husband and their two adult children aren’t sure whether it’s worth sticking it out at Altgeld-Murray. And the problem isn’t the gangs or the crime. “I want to know how this is public housing and you got people here that’s paying $1,000 a month,” said Williams, who asked that her real name not be used in this story for fear of retaliation from the Chicago Housing Authority. For years, the Williams family has paid about $500 a month for its three-bedroom apartment at Altgeld-Murray, the city’s largest public housing development with some 2,000 low-rise units ringed by the Bishop Ford Expressway, a 250-acre landfill and the Calumet River. Right now, the family pays $672, Williams said. But a new CHA rent schedule shows that the Williams family will have to pay $875 a month when they come up for recertification this fall. A four-bedroom apartment in the development could rent for as much as $1,025, according to the CHA’s rent schedule. “There shouldn’t be any apartments out here that cost $1,000. That’s absurd,” said Geneva Smith, a resident of Altgeld Gardens when she spoke with The Chicago Reporter this summer. Smith has since moved. Since 1998, the U.S. Department of Housing and Urban Development has required housing authorities to charge all tenants either 30 percent of their income or a flat rent, based on local market conditions—whichever is lower. But, for several years, the CHA has had rent ceilings in place that were far lower than market rate prices. The new rents kick into effect this year and next year, as residents come up for their yearly lease renewal. And, as mandated by federal law, the CHA will be charging every public housing family 30 percent of its annual income or a flat rent based on market conditions—whichever is less. All families will be required to pay at least $50 a month. The change won’t affect most CHA residents since, for many of them, 30 percent of their incomes was lower than the old ceiling rents—typically, $346 for a one-bedroom unit, $408 for a two-bedroom, $510 for a three-bedroom and $561 for a four-bedroom. Even though the new flat rents will be more than the old ceiling rents, those families will continue to pay 30 percent of their incomes. But, for the CHA’s highest wage earners, who have been paying the ceiling rents since those amounts were less than 30 percent of their incomes, the new rent policy will mean an increase in rent—and, in some cases, a substantial increase. Thirty percent of the Williams family’s $36,000 annual income is $10,800, or $900 a month. So, even though the $875 flat rent for their three-bedroom apartment is less, it’s still roughly 30 percent more than what the family has been paying. The CHA sets flat rents based on neighborhood market value, unit size and other amenities, such as whether a unit is new construction or newly rehabbed. For instance, the flat rents in a scattered-site building will range from $400 a month for a studio to $1,025 a month for a four-bedroom, but the flat rents for CHA units in The Domain Lofts, a Near North Side luxury condo that includes a handful of public housing apartments, will range from $1,200 a month for a studio to $2,250 a month for a four-bedroom. Gist Gilliam said the flat rents were determined after CHA employees examined 15,000 units and market rent conditions in the city’s 77 community areas. “Given that most folks will be paying 30 percent of income, it’s neither here nor there,” Gist Gilliam added, citing the CHA’s own research, which found that 87 percent of public housing families earn $20,000 or less and would not be affected by the removal of ceiling rents. Since 1990, the CHA had been granted temporary permission by HUD to set rent ceilings. At the time, then-CHA chairman Vincent Lane was quoted by reporters from The New York Times and Chicago Tribune that the rent caps were necessary to keep working families in developments. Though the rent caps varied from development to development, they meant that working families and seniors with pensions rarely paid more than $400 to $500 a month in rent. Williams of Altgeld Gardens said it was absurd to be paying market-rate money to live in public housing, but that doesn’t mean she’s about to leave. She’s not interested in the private market unless she could buy a house. And she doesn’t buy the argument that Altgeld Gardens is too dangerous to spend more than $600 a month in rent. “This has always been a community of working people, We got nurses, we got people who work for the CHA, the post office, we got construction workers, government workers,” she said.